The nuttiest thing we’ve ever done as a family was to move out of our house and into a one room trailer. A tiny house. Two adults, a four year old, and two cats in a 120 square foot camper. We hauled all of our own water, used a composting toilet, a solar shower, and we tried to exercise extreme patience with each other. For almost 6 years, we lived in the camper/trailer, set up in the back corner of a friends’ property, paying no more than $200 a month for rent. We did have a small tipi and access to storage in the pyramid visible in the picture. That’s our camper on the right. The original intention was to save money and use less resources. We wanted to live simply and intentionally, and learn to live with less stuff. It was hard to do. Hard, but good. We had a lot to figure out at first. Lights and water: We had one very very long extension cord to power our lights, which were 4 CFL bulbs and we had a tiny refrigerator and portable CD player, and we used a gas stovetop for cooking. Access to wash water was from a frost-free valve a few hundred feet away, and I hauled 5 gallon carboys of spring water for drinking. Most camper and RV water systems are susceptible to freezing and then bursting, so I made a gravity-feed system out of a 5 gallon olive oil jug, with food-safe tubing and a nozzle for a hose. This system sat at the corner of our tiny loft, with the hose over the sink, and we filled it once a day. The gray-water drained out the back and not into the storage tank. If we had done that, as an RV does, then we would have had to find a place to empty it and clean it. Heat: In the winter, I covered the door and windows with strips of wool blanket cut to fit, and we used an oil-filled electric radiator for heat. The gas heat that was built into the camper had an electric fan that ran on 12 volt power, but the battery would quickly go dead and the fan was so squeaky that we gave up on it. And, I wasn’t willing to risk a gas-burning stove in a tiny space with us as recommended by the people on the blog “ SmartlyHeated“. The heater was our biggest electrical draw, by far. The thin walls of the camper lost heat quickly, and the floor was usually pretty cold, but by covering the roof with a tarp, and the windows with blankets, and by putting another rug or two on our floor, we managed to survive some severe winters in there. -15° type of severe. It was hard. But good. toilet – a stand for a 5 gallon bucket with a toilet seat on top. We used pine shavings and sawdust for cover material (to cover your business). The materials for the humanure system were either cheap or free. Many institutional food services (schools, universities, hospitals) have a surplus of buckets and lids available for the taking, and a compost bin can be built for cheap. Animal bedding or pine shavings from a feed store works well, but even better is finely chopped leaf mulch or sawdust from a sawmill or wood shop, especially if it comes from raw lumber, not kiln dried wood. Composting: I used a roll of hardware cloth (mesh fencing) that I fastened end to end, making a circular heap. I staked the bottom to the ground to hold it still until it was part filled, and I only turned the pile after it had been full for a while. Between the bathroom and kitchen waste, we generated a large pile of finished compost every year. The only difficult times with the Humanure toilet were when we had sub-zero temperatures outside, and we had a full bucket, and someone really had to go. Spare buckets and lids are like gold on those days. We used a separate pee bucket (or went outside) so the toilet wouldn’t fill up with urine. Trust me, a solid bucket is way easier to handle than a sloshing bucket. You could also consider a sun mar composting toilet. Well, we saved paying a ton of money on rent, and our energy and water use went way down during those 6 years. We generally used less than 10 gallons a day of water, drinking and wash water together (2 adults and one child, then another baby for the last 2 years). Our four 20 watt light bulbs were in use for only several hours in the evening, and we used headlights and candles when we could. One major issue for us was that we ran out of room for beds. 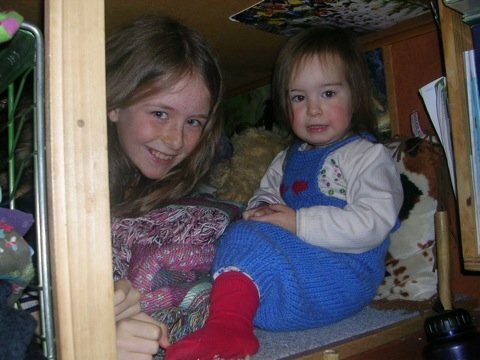 Our oldest was crammed in the loft, and our youngest was outgrowing our bed. Eleven months ago, we moved into a real house, a “house”, paying full rent, and parked the camper in the driveway. We’ve been living it up with hot water, a bath tub for the kids, central heat, and rooms with actual doors. Our original plan was to sell the camper to someone else wanting to try out the tiny house experiment, thinking that we’d outgrown it, but I’m already tired of paying high rent. The trailer is looking tempting again. Check out these excellent tiny house resources. It is always nice to see other people trying to minimize their impact on the earth, and living off of less. We’ve had a similar “experiment” for the last 2 1/2 years, two adults, one dog. 200 sq. ft.
We use an Envirolet low water composting system, expensive but very nice. Yes, people probably think we are nuts, but it really is smart living. Pay attention to the amount of water you consume, how much electricity you actually need, and where your waste goes. While we might be moving into a house soon, the lessons learned will follow us wherever we go. I’m in complete disbelief – you did this for 6 years and with two kids and two adults? Well done! I love this story. I could do that myself–if I had a spot to park the trailer. I totally understand the reasons for doing so. I like to live cheap too. I currently have a bachelor apt. in a house with a family from Korea. (they own the house). It costs me $500. a month which includes ALL utilities and even includes cable TV and hi-speed internet. I get ZERO bills in the mail. I got rid of the land-line phone 5 1/2 years ago and use a cell-phone that costs me $12.50 a month. The only thing that I question about your experience is that you had 2 cats in there, too???? lol. Even though I choose to live cheap I have a job that pays $32. an hour. What do I do with that $32. an hour? Help my kids buy “stuff” that they think they need! lol (they are all grown adults with children). Really nice people (my kids) but they have no clue how to live cheap. Anyway, I salute you & wish for you much happiness! How does social services feel about this? They tend to get pissy about the strangest things now. We kept our living situation on the down-low, so we never got visited by the SS. I’m sure they would frown on most alternative living situations. That brings back so many memories. I lived in a caravan for just over two years. Post divorce/realtionship getting over and all that jazz. Mine was a 15ft tourer. Lived alone but plenty visitors. Had to move on every 4 weeks. The eagle kept landing over and over again. Some sites let me stay longer…. It was lovely…so peaceful, time to get my life together. Some friends felt sorry for me and some felt envious. I was sooooooo happy! Its a mental attitude! An attitude of acceptance and peace. I think it would have been harder with the kids… mine were grown up and fully fledged at the time. You will cherish the memories! .-= Karen´s last blog ..Richard Matthews is now a member of Pledging for Change =-. You should maybe consider a narrowboat. Best of both worlds. A bit more space and facilities…. and that great outdoors. Keep moving and educate the kids yourself! Lifes to short to be chained down…. We lived in a Toyota Dolphin motorhome with 2 kids for a couple of years. Loved it. You learn to cut your stuff back and be outdoors more. I’m looking forward to that lifestyle again someday by myself. We definitely got a whole new appreciation for the weather, come January in Colorado. It is quite lovely to know that you can learn to live with lots less stuff, though, and some days I really miss it (but I do enjoy having hot water on demand…). This reminds me of my one year living off the grid experiment back in the ’70’s in VT where it gets -30 in the winter! Heating with wood, no running water… But I didn’t do it with a family! THAT is a whole new level of walking the talk! Wow! I’ve never had an experiment like this so it is a great story to read. Good for you! I guess you win the green dad award now! LOL! .-= sommer´s last blog ..Korres Skin Care: Hook Line and Sinker =-. .-= Jen @ Eco-Office Gals´s last blog ..Flaunt It! Monday: myEARTH360 =-. Thank-you so much for that story. It was amazing what you did. I’m too young and too old to do it at the present but it gives me tons of ideas for the future. I don’t think I could stick it out as long as you did though. Good job! Wow.. sounds nuts to me, but it looks like you knew what you were doing. I’ve used on of those Humanure Toilets before, and it wasn’t that bad. Frankly, it was something I think I could live with, as long as there are plenty of sawdust around. Derek, this is exactly what we’re getting ready to do. I’m nervous, excited, anxious, overwhelmed all at once. Of course we’ll be traveling while doing it. But still, it’ll be an interesting experiment. I can see us having a hard time adjusting. I can also see us having a hard time going back. .-= TheOrganicSister´s last blog ..I just want to feel good. =-. Wow, cool idea – We never took it on the road, but it looks like our family’s ultimate goals are similar. Best of luck to you, and I look forward to reading about your adventures! Canadians build Straw Bale houses, Solar heated even at -40C Winters, and garden, pressure canning food and meat for long cold winters. They have abundant clean unpolluted water and some wood to burn for extra comfort, they compost, humanure, like Swedes, and survive! Some have “Stack wood” houses – same great insulating factors, and cheap and easy to build too! Yankee Doodle so propagandized as to miss some of the better ideas! Look at every day Norwegian country life! Check out home steading in the states on web, look at the off-gridders stuff, get away from the crummy cramped factory built corporatist notions of what is good for the proletariat, and break away from the cubed-in thinking! Folks living in rammed earth homes, very comfortably, yet harassed by civil codes of the corporate monster’s design! Folks in India bio-gas communal sewage collections for free cooking and heating gasses, not like Americans, owe nothing to OPEC, keep Sons and Daughters off the corporatists battle fields, pay no flesh-bribes to the OPEC corporatist monopolists of the world! You are on the right track, used the wrong tool, a corporatist , made for highest ROI (for him!) product and suffered! Don’t get sucked in next time! Folks are living more comfortably in caves, off grid, and in secret, in America today! Read between the lines on some of the sites on web! Discover the “Network” a new reality in America! Good On You! Shanty Towns be damned, off -grid, way to go! Fvck the corporatists, every way you can! Interesting story. I spent a lot of my childhood years growing up in a travel trailer due to lack of money. As a child I didn’t mind it too much, but as an adult it isn’t really something that I would choose to do. Thats pretty interesting and if there werent kids in the situation I’d think its totally cool, but since there are..I dont know if a crammed trailer is the best place for a kid to live, specially considering that it was by choice. Suffering such harsh winters without heat and with those paper thin walls sounds too much. I support experimental off-the-grid living by yourself or with other adults, but when there are kids involved, you gotta think whats best for them first, IMHO. Well, we see that our kids are much stronger than we think, and they suffered no hardship because of it. Besides, 2/3 of the world lives in what we would consider to be substandard conditions. We’ve also taken them on extended camping trips (5 weeks) and they lived in a tent with us, again with no suffering on their part. I love the last picture of the kids. It looks cozy, and like it was a lot of fun (at least some of the time ;)). We are moving back into our travel trailer next weekend. We have two kids and two dogs. We did it for six months previously because we moved to a new place and wanted to save some money but this time it is out of financial necessity. It is going to take a while to adjust but we were so much stronger when we did it last time. I keep telling myself that God never gives us anything we can’t handle. I have to believe that to keep myself going! Best of luck to you on your transition! And you’re right, I think. We don’t ever have anything come our way that we can’t handle (and get stronger as we do handle it). Cheers! Wow, amazing. You’re a brave family! Amazing you were able live in the travel trailer for 6 years. We are currently working towards getting into a fifth wheel camper with 2 dogs and a cat. It’s all about simplifying and loosing the mortgage, and therefore loosing the extra added stress. It’s nice to know there are others out there with the same ideas. I’m Not Crazy!!! Like the idea of saving rent. Most of have so much clutter, if we could get rid of it we could live in a much smaller place. It gives me inspiration to try after reading your story. Oh I was so glad to read your story. I have also been wanting to live a more simple life. So after school got out last year my husband, 4 children under 10 and one mid size dog moved into a camper that looks like it is set up very similar to yours. Althou we stayed in a camp ground and used the sewer and water system that was in place. It was tight but good. By mid summer we were offered the use of a 35′ fifth wheel and we jumped on it. It was so nice to have a little extra space and a private bedroom. The kids slept on a hide a bed in the living room and another coutch. It worked out great. But as school was about to start my husband and our family and friends thought we needed a house. So here we are just moved in last week and are paying 1100 a month not to mention the 180 gas/electric bill. Lets just say I am less then excited. I miss my little camperr that love grew so strong in. Now it seems that everyone has there own space and are taking full advantage of not being together. I love the song by alen jackson love grows best in little houses. It is so true and when us americans start putting that into play again we will be better off as a country. Thank you thank you for letting me know I am not the only one out there with children willing to do a little extra for the sake of family and well if the savings comes along then thats just an extra bonus. We bought a wood a few years’ back. We live in London and we were just so fed up with being away from the countryside. I used to obsess about moving out, but I also knew (from my childhood) that the countryside can be a lonely place (especially as I don’t drive!) and so many of our friends live near us in London, we’re very lucky. So we bought the wood. And we go there for long camping holidays without any running water or cooking facilities. It is BRILLIANT. And what’s really great is how much my family have got into it too — having thought I was insane! Our plot of woodland is within a much larger wood, and there are lots of others like us who just visit for weekends and holidays. But there is a family that lives there too. They are the nicest, happiest family I think I know. They used to live in a tiny caravan with three children in the middle of the wood. Now, they live outside the wood (much safer away from the trees) in an old stable yard. They have a static caravan and a horse box, where two of the children and their new baby) also sleep. I’m not sure I could do it, but I love that they do — and love spending time with such amazing people. PS. I’d love to write about you on http://jorgandolif.com/. Would you be interested in an interview? Wow, that was really roughing it! My husband bought 30 acres of undeveloped property right before we were married and we liked to go out on the weekends and cut down trees and have fun. We eventually added a travel trailer, and then built a barn with living quarters. I still think fondly of those days camping out under the trees, but I don’t think I would give up my a/c and hot water for anything now! Wow,,awesome!Living in a cheap way is great.Save a lot of expenses less household chores and less bills-never get disappointed of what you are right now! God always love us. What a crash course in voluntary simplicity! 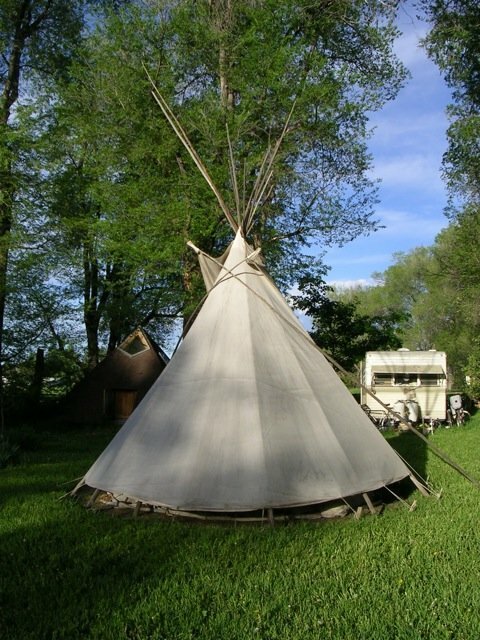 I want to live in a yurt with my husband and two kids…perhaps only for a year or two. This is a funny page to stumble upon, as we are in a similar situation. My husband and I have a 2 year old son and have been in a 8×20′ RV for 2.5 years now. We are starting to feel seriously squished…would you go back to the trailer now that you’ve been in a house? Honestly, sometimes I miss it, but if I did it again I would probably invest in building a tiny house, with much better insulation and a more thought out design. Trailer Life gets old in the middle of winter or the heat of summer. We just bought a camper trailer today. We will be moving into it with our three sons, two cats and a dog as soon as we get the permits and utilities out at our rural acreage. I am excited, a little scared, and hopeful. I do not want a mortgage anymore and all we choose to afford is a camper trailer. But kudos to you brave souls who really roughed it. Our camper will have heat and a/c, and a water heater, sleeping areas with sliding doors, etc. Its not as brave as you guys, but I am still scared of the unknown we’re about to step into. Here’s hoping! Thank you very much for sharing your experience with us. I would love to do something like this, live more naturally and find a small community of like minded people who would live and work together. Best wishes to you and your lovely family! I don’t know if I could give you an amount that we saved, but going from paying full rent to free (at first), then just $100 a month to friends for a place to park our trailer meant that we were spending much less than when renting a house. We also didn’t have any utility bills, which added to our savings. My husband and I after all these years are going this way.First we found some property and it wasn’t easy but we knew what we were looking for.3.5 acres under 10 grand.Then we are going to put a portable cabin on it,under 7 grand.All we have to do is get a septic system in under 1500.00 and we got it made.We have a huge place for a garden and a nice large shed that came with the property and a well.The cabin is a rent to own.We might try to finance it for lower monthy payments.There is no insurance on the cabin nor the property unless we want to pay it.If you want to go cheap this is a way.The cabin is a 14×40 and its just the shell you do the interiors. 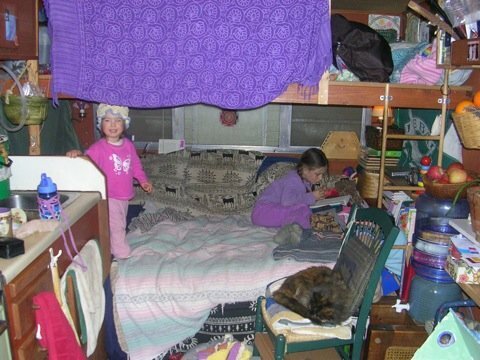 I did a Google search for living in a camper to see who else is living like our family and stumbled across this post – awesome! It’s not very often I read a story like this and think, finally someone I can relate to! The part about the buckets being like gold I just had to laugh because I’ve been there done that! My family of six lives in a 31′ bunkhouse camper, we’ve been out in the middle of nowhere for a year and a half so far while we cash-build our house. Completely off-grid, with solar power, compost toilet, etc. We just published a book, A Year In a Camper, about our first year’s experiences. You can find it on our blog or on Amazon.com. Nice to meet you! This is really awesome and congrats for doing it, not many people would have courage, me included! I’d mostly miss my privacy and a quite place to relax when I wanna be just with myself, my thoughts and take a day off from the usual stuff. How did you manage it, I mean, 4 people in a tiny trailer, I’d probably go nuts! This actually really appeals to me, even with the kink and hiccups you have to go through… I’m trying to live a simpler stuff in my apartment, not quite as invested as you, but I’m trying. I’m seriously impressed with what you managed to do here though, thanks for sharing! Hi. I loved reading your story. My hubby and I live in a 16 ft. camper with our 4 (yes, four!!) Med./large dogs in central NC. We have a baby on the way, due in about 2 months. I am wondering if you ever had any trouble with the dept. social services, etc..
No, we never did, but we were also well off the main road, and not too many people knew we were living there. Awesome! I lived in a bus for awhile, and then a tent for about 6 months with one child and another on the way. Slept on solid ground until the morning I went into labor. Best time of my life. Living that way really tunes you in to the timing of nature. Start that camper up and travel! Always willing to throw a tent up in my yard for visitors if you are heading to upstate NY! Fantastic story! You would never guess what the inside looks like by seeing it from outside. Wow, you really went all out! I love the tiny home movement and stories like these are why I do what I do.